Well I finally did it. Thirteen months after setting the goal of doing a tri, I did my first one yesterday. 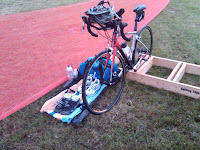 It was a sprint tri in Effingham, IL. When I first set the goal, it was just to finish. As time went by, I set a goal time and reduced it a couple times during the year of getting in better shape. Cheryl was able to go to the race too, so that was nice. The day before we checked out the race site, drove the course, went out to dinner and watched a movie. I got up at five in the morning to get ready. I was a bit nervous so I ate less breakfast than normal. 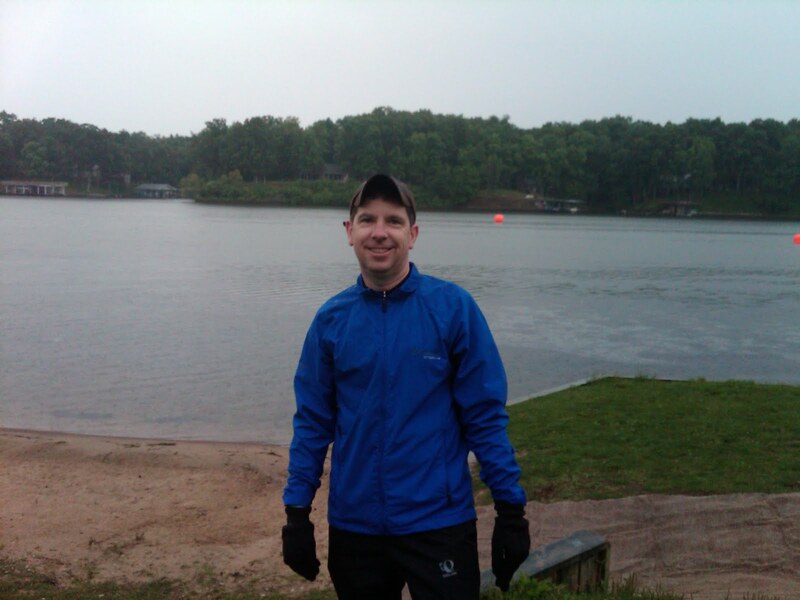 The weather wasn't perfect (53 degrees and raining) so I missed out on some pre-race comaraderie, but I had a blast anyway. I racked my bike, set up my gear then covered it all with trash bags. There were a lot of really sweet tri bikes there. Lots of wheel sets that were easily twice what my bike cost. I was hopeful I would pass at least one of these $5k+ bikes. I figured someone had to have more money than fitness, but I was wrong. Well, I did pass one Cervelo, because they had a mechanical problem :-). About 15 minutes before the race, I put my wetsuit on. My hands and feet were cold, but the wetsuit kept everything else nice and warm. My feet got ice cream head aches walking down to the lake. It was a mass start and I stayed back for about 15 seconds to let most of crowd pass since it was my first OWS in a crowd. The first 25 yards or so had really thick seaweed. It felt like the seaweed was grabbing me and trying to pull me under like in a horror movie, but I didn't panic. In fact, I was very comfortable with the swim. I stopped a couple times to get my bearings and just look around and enjoy it. I had some trouble sighting and definitely got my money's worth out of the swim course. I easily got an extra 100 yards out of it :-). 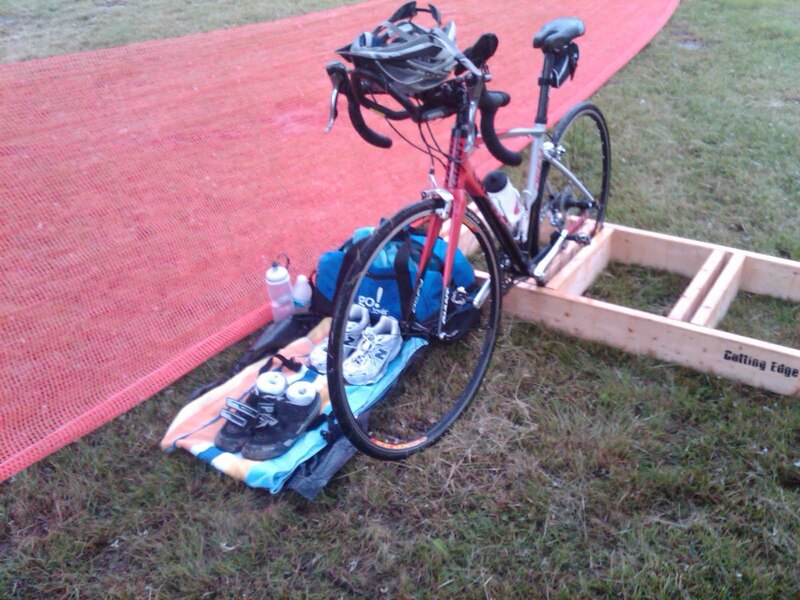 Once out of the water, I ran up to the transition area. I had a water bottle to wash the sand of my feet, but it was so wet and muddy, I didn't bother. I could have been a little faster in T1, but I was enjoying it. Cheryl was on the other side of the fence asking if I was having fun so I chatted with her while I stripped off the wetsuit and put on socks and bike shoes. Nice pic of me chatting in T1. Probably why my time was almost two minutes. Then I was off. Everything was fine on the bike but my fingers. My speedometer got messed up so I had no idea how fast I was going, but I felt good. At one point I noticed I wasn't breathing very hard, so I picked it up a little. It was an out and back (which was nice since there were only three turns on the whole course and me having not biked much in the rain) and I felt great on the way out. The way back was West to East so I thought I would be even faster on the way back. Nope! The wind was coming straight from the East (note to self, check the wind next time). No big deal. It's only a sprint. Back to the transition area, no fancy flying dismounts or anything, keep it simple. This transition was faster (under a minute). I had dry socks but didn't bother. Everything was wet and muddy and my toes were numb. They always go numb when I ride and the cold made it worse. I felt pretty good and was having fun. Two of my numb toes felt like something was jammed in between them so I stopped about a half mile into it and took off my shoe. Nothing jammed in the shoe, just numb toes. They finally stopped being numb in the last mile. I could have pushed it a little harder on the run, but not much. Overall I missed my goal time by two minutes. If I had taken a slightly less scenic swim, I would have hit that easily. Overall, it was a great experience and I had a huge smile on my face the whole time. If I had to sum up the experience in one word, it would be "alive". I read several blogs from triathletes and I always think, wow, they seem so alive and enjoying life. Doing my first tri made me feel that way too. Excellent Are you eager for the next one? wish I could have been there to watch. Yep, next one is next weekend.